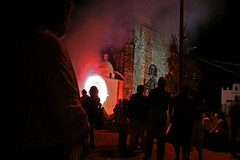 Yesterday we went to see Tochimilco a small town near Atlixco (about 15 minutes away and 40 minutes from Puebla). We didn’t know they celebrate the Asuncion day and we got a good surprise seeing this catholic festivity there. Tochimilco is a small town with colonial history, they have an aqueduct and a Franciscan ex-convent, what impressed me more was they had a pool for Indian Baptism into catholicism and in a near town there is a church with a separate building for indian listening the homily. I posted two images in my Flickr account. I will upload more photos of Tochimilco in a¡one of my Flickr set. You have to see the people watching the fireworks, we couldn’t stay until they display the larger one. It was taken with a mini-tripod in a wall. Panorama done with several photos (about 10) taken with 18mm lens.